Murcia San Javier airport is situated on the north shore of the Mar Menor, in an inner lagoon of 170 kilometres which is perfect for doing all kinds of sports: sailing, golf, climbing, trekking, and so on. The strategic location of the airport takes you to a Mediterranean culture built on the pillars of different civilisations and settlements that left their mark and influences. Besides, the weather conditions - with an average annual temperature of 19 degrees - are ideal for both winter and summer tourism. Murcia San Javier is an air base open to civil traffic, as stipulated in Royal Decree 1167/1995 of 7 July on the use of airdromes used jointly as an air base and an airport, and of air bases open to civil traffic. Thus, the airport shares runways with the General Air Academy, where future Air Force officials are trained. 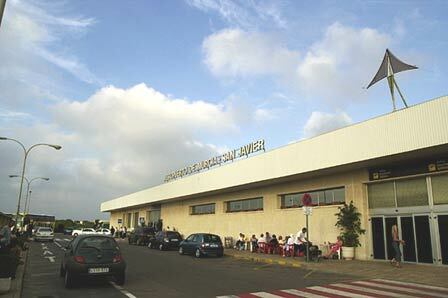 Since 1996, San Javier airport has experienced linear growth in passenger traffic and has consequently become a fundamental node with regards holiday and leisure transport to and from the Region of Murcia. During the years 2001, 2002 and 2003, it was one of the domestic airports with the greatest growth; 39%, 44% and 77%, respectively.